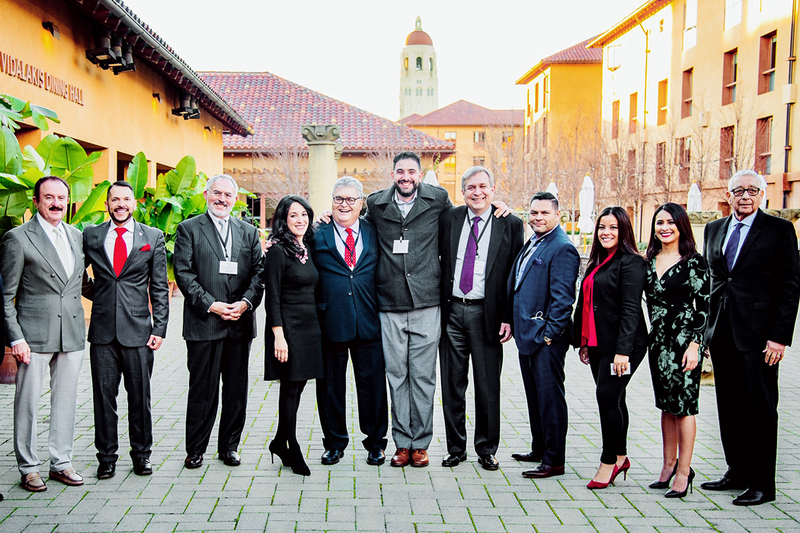 The Stanford Latino Entrepreneurship Initiative (SLEI) celebrated its fourth year by unveiling its 2018 State of Latino Entrepreneurship Research Report on January 25, 2019. SLEI is a collaboration between Stanford Graduate School of Business and the Latino Business Action Network, headed by CEO Mark Madrid. Since 2015, the initiative has annually collected data on Latino business owners across the United States to provide trends in Latino entrepreneurship. The 2018 report compiles data from SLEI’s survey of 5,000 entrepreneurs, its research panel of more than 1,000 participants, and other national sources. “Getting our arms around the data is essential to learning the successes and challenges for Latino business owners,” said Persis Drell, Stanford University provost, during introductions at the State of Latino Entrepreneurship Forum. SLEI faculty advisor Jerry I. Porras emphasized the significance of the Latino population in the coming years. Today, Latinos make up 17 percent of the US population and soon will make up one-third of the population. “Not only are Latinos part of the mainstream, but tomorrow their impact will be substantially greater,” Porras said. Paul Oyer, also a SLEI faculty advisor, spoke about the tremendous growth in Latino-owned businesses that they have seen in the past few decades. The number of Latino-owned businesses grew by 46 percent, and there are around 5 million Latino-owned businesses in the United States. The growth rate outpaces that of all other groups, including those owned by whites, Asians, and African Americans. “Twenty-two percent of scaled firms applied for $100,000 or less and even though Latino owners are applying for smaller amounts, the research shows that they are still not getting approved,” Orozco explained. One of the reasons is insufficient collateral. Surveys also show that two strategies positively correlated to scale include business certification and exporting goods and services. Scaled Latino-owned firms (58 percent) are more likely than unscaled firms to hold Minority- and Women-owned Business Enterprise business certification, which provides access to contracts not available to uncertified firms. As for exporting, the report found that 14 percent of all Latino-owned companies export and are more likely to be profitable and scaled companies. Following the report findings presentations was a panel moderated by Victor Arias, chairman and cofounder of the Latino Business Action Network. The panel was composed of four SLEI-Ed alumni: Rafael Alvarez, founder of ATAX Franchise; Christine Sax Stotesbery, president of Dorado Accessories; Derek Goldstein, CEO of Casaplex; and Maria Marin, president and CEO of Unlimited Recycling. Each panelist shared their beginnings with their respective businesses and their personal experiences with the key findings from the report. Stotesbery’s company, Dorado Accessories, sells to major retailers in the United States, and Stotesbery spoke on the importance of exporting when it comes to scaling the business. Dorado currently exports to Canada, Japan, the United Kingdom, and Mexico. With a new office in Puerto Rico, Stotesbery hopes to use that to expand to Caribbean and Latin American countries. Rafael Alvarez wasn’t surprised about personal credit because to him, that was always part of the package. But receiving funding is rough. When he began his business in 1986, he had $200 in savings, two computers, a fax machine, and $18,000 that he had received as a loan from his closest friends. Maria Marin has been able to find success in scaling her business, Unlimited Recycling, through certifications and networking. Soon after incorporating her business, she earned her minority-owned business certification. In addition to earning her certification, Marin also sought out organizations to be involved with, such as a building association. “When you network, you start finding what’s out there,” she explained. Then, in 2002 at the recommendation of one of her clients, she completed the Small Business Administration’s 8(a) Certification program. To cap off the two-hour forum was a fireside chat between legendary businessman Sol Trujillo and Century21’s former president and CEO Nick Bailey. The pair spoke about innovating as a leader and the responsibility of leaders to fill the gaps. And when it comes to applying for a line of credit, Bailey said it is all about mind-set: that bank is there to sell you money. You can download the 2018 State of Latino Entrepreneurship Report here.